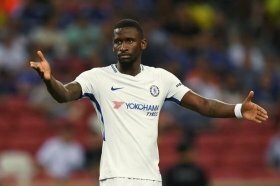 Chelsea manager Maurizio Sarri remains hopeful that Antonio Rudiger has sustained a minor knee injury during the club's Premier League clash against Liverpool on the road. The Blues went into the game with the bid to hamper the Reds' title credentials while enhancing their prospects of making the top four for the Premier League season. However, that was not the case with the Reds securing a 2-0 triumph in the end, and the match also affected them on the injury front with Rudiger suffering an apparent knee problem. Speaking after the game, Sarri said that the injury setback for Rudiger does not seem serious and he is optimistic that would be the case after the necessary medical tests are conducted. "I hope nothing serious but at the moment I am not able to say anything. We need another visit with the doctor and something else to be sure it’s not serious," he told Sky Sports News. Chelsea are currently fourth in the standings but they face the prospect of dropping outside of the Champion League places, should Arsenal beat Watford on the road on Monday night.